Valentiner, Wilhelm R. Rembrandt Handzeichnungen. New York, 1925: no. 352. Rotermund, Hans-Martin. "Rembrandts Bibel." Nederlands Kunsthistorisch Jaarboek. 8 (1957): 139 (composition by Rembrandt, though possibly not the execution). Sumowski, Werner. Rembrandt erzählt das Leben Jesu. Berlin, 1958, p. 131 (as Rembrandt). Haverkamp-Begemann, Egbert. Review of Benesch 1954-7. Kunstchronik. XIV (1961): 21 (as Rembrandt School). Sumowski, Werner. Bemerkungen zu Otto Beneschs Corpus der Rembrandt-zeichnungen. Bad Pyrmont, 1961: 4 (not convincing as Rembrandt). Sumowski 1981,vol.4, no.950a(x) (as Govaert Flinck). Wheelock, Arthur K. "The influence of Lucas van Leyden on Rembrandt's narrative etching'" in Essays in Northern European Art presented to Egbert Haverkamp Begemann (Doornspijk, 1983): p. 290 (as Rembrandt). Royalton-Kisch, Martin. Drawings by Rembrandt and His Circle in the British Museum. London, 1992: 41 (as Govaert Flinck). Hautekeete, Stefaan. Les dessins de Rembrandt et ses élèves appartenant à la collection de Jean de Grez, Brussels, 2005, under no. 22, (as Govaert Flinck). Royalton-Kisch, Martin. Catalogue of Drawings by Rembrandt and His School in the British Museum. London, 2009: under no. 7 (as Govaert Flinck). Sutton, Peter C., and William W. Robinson. Drawings by Rembrandt, His Students, and His Circle from the Maida and George Abrams Collection. New Haven, 2012: 82, under no. 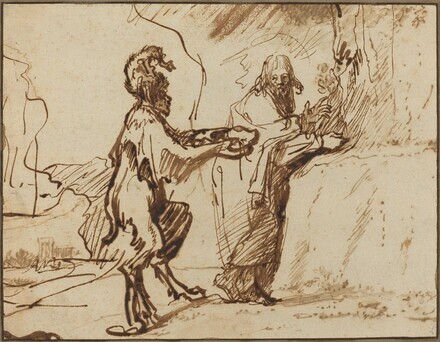 22 (citing Schatborn's opinion that this is one of a group of drawings by Flinck).